Machinery Building - Canada Forgings Inc.
A variety of industries utilize machinery building, such as paper and pulp, mining, on- and offshore oil drilling, food processing, transportation, and more. All of them call for highly specialized open die forgings to facilitate the high demands they face. CanForge has the inventory and the vast knowledge required to work with designers and engineers to meet all of their forging needs. As opposed to other methods of metal forming, forging provide numerous advantages, which can lead to a longer service life and cost effectiveness. Forgings have a directional grain flow, which guarantees significant strength, metallurgical reliability, and remarkable fatigue resistance. Since forgings can be very close to near net shapes, this allows for less material usage and unnecessary machining. 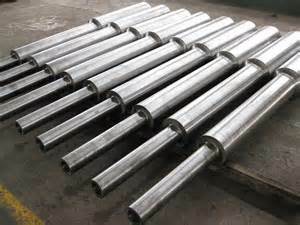 CanForge has been providing forgings to the machinery building industry for years. CanForge offers forgings of whatever quantity, size, and weight you need to perform at the highest standard. Call or email us today to learn more about our forging inventory.